TOM PARKER was all about making money. Nothing else seemed to matter. And he never missed out on an opportunity to make an extra buck. In fact, just about everything Parker did served the goal of making money. And even more money. 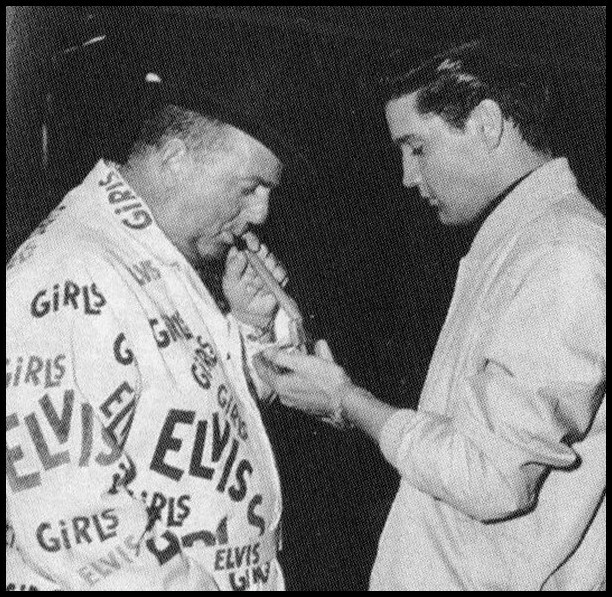 We all love to hate the man who referred to himself as ‘The Colonel’, and Elvis is usually praised for all the good things during his career, while Parker receives the blame for all the bad decisions. But how bad were the bad decisions? 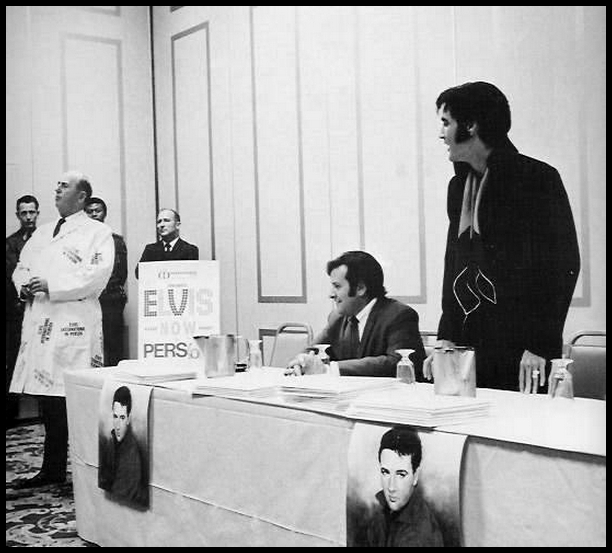 Did Elvis spent too much time in Hollywood, and did he spent too much time on stage at the International? No. Everything went according to plan. That is, according to Parker’s plan. Money kept pouring in. So Parker continued to do what he was good at: making lots of money for himself and his client. 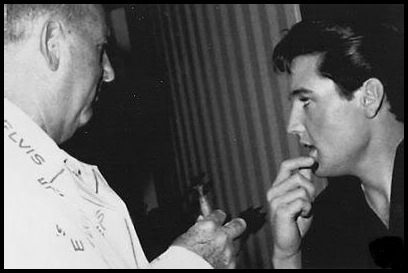 Any weak decisions on behalf of Elvis Presley? Yes. 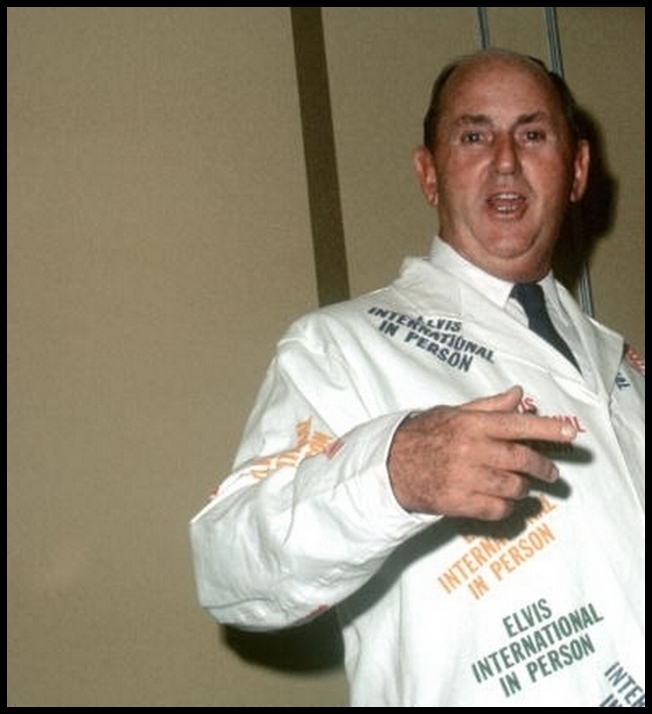 Should he have moved to a new manager in the early/mid 60’s and chose a different path for himself and his career? Yes. 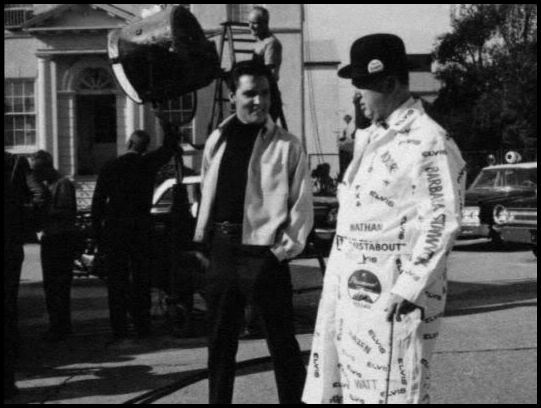 Every now and then a photo of Parker on a filmset pops up in which he is wearing a specially designed white coat that promotes the current movie. As some sort of walking-talking-human-promotional-sign, Parker would let himself be noticed by the members of the press. In this article we take a look at PARKER’S AMAZING TECHNICOLOR MOVIE-COATS. Enjoy! 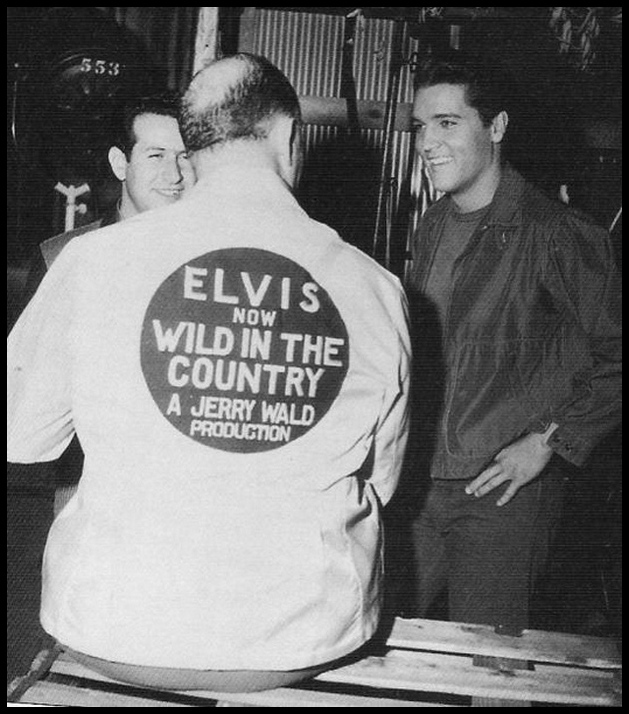 The first time a special movie-jacket popped up, was at the G.I. 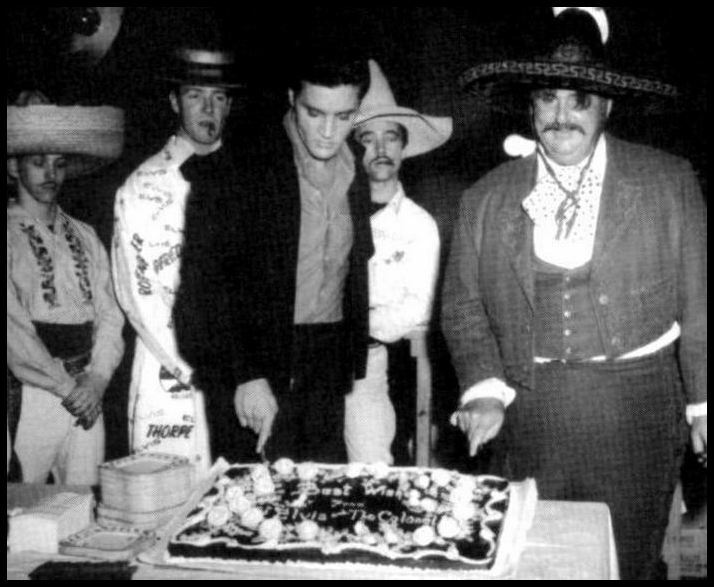 Blues birthday party. 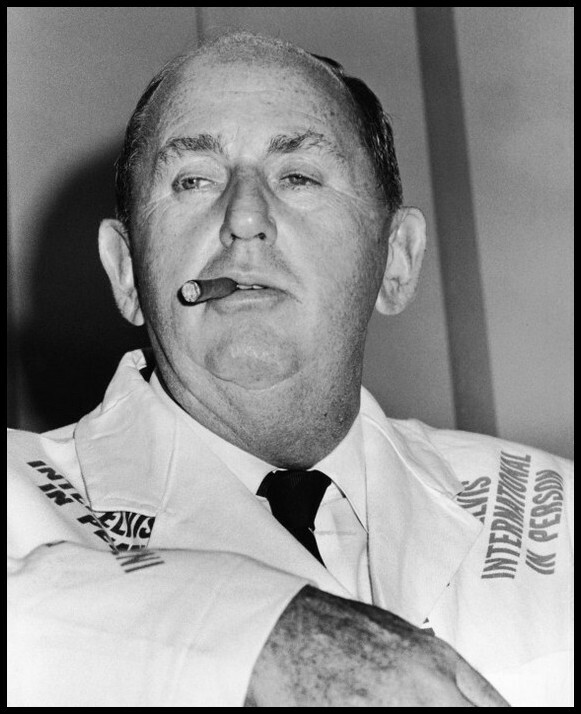 Parker probably thought it wise to try this brilliant new marketing idea of his out on Trude Forsher and Tom Diskin before he started wearing these fine pieces of clothing himself. 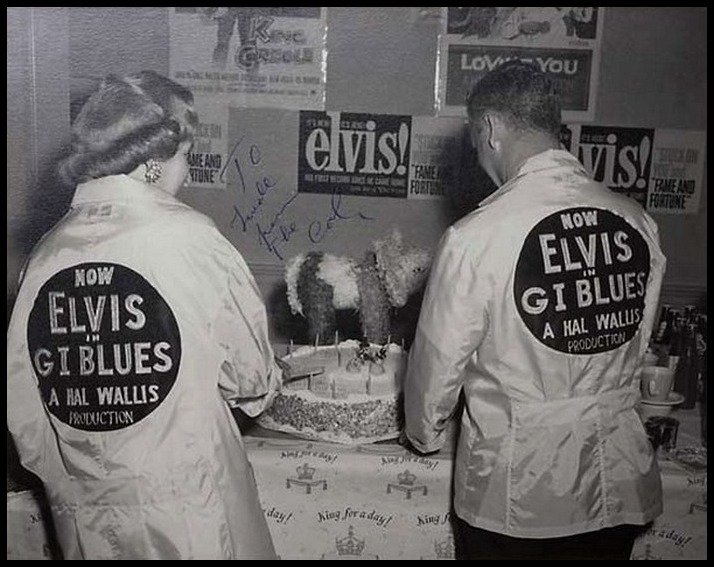 On the wall we can see movieposters of Elvis’ earlier films as well as an RCA banner promoting the Stuck On You single. 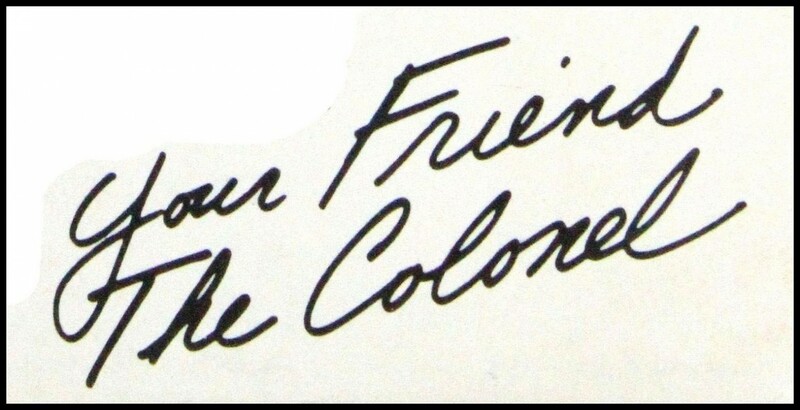 Whenever the press was invited to a movie-set, Parker would make sure that the walls would be decorated with posters, banners, sheet-music, record-sleeves, etc. in an effort to further commercialize whatever could be commercialized. 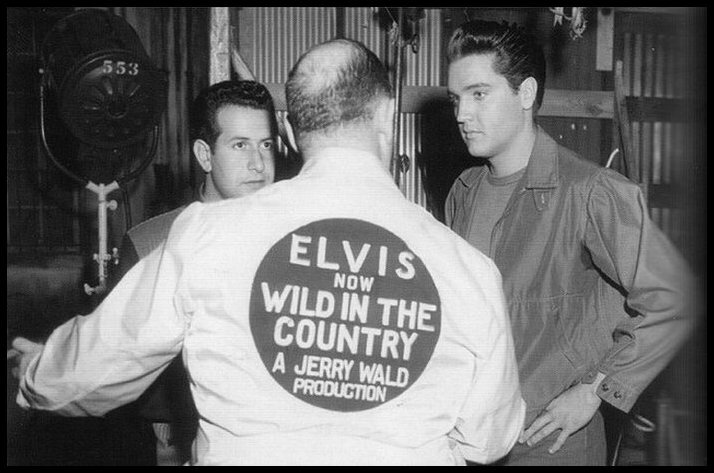 On the set of Wild In The Country we can see Parker wearing a movie-jacket for the first time. It was an almost exact replica of the one for G.I. Blues. Some major changes in the design-department: the jacket has become a coat! And not just more fabric was used, but also plenty more colors. So, please welcome the first official Tom Parker Movie-Coat! 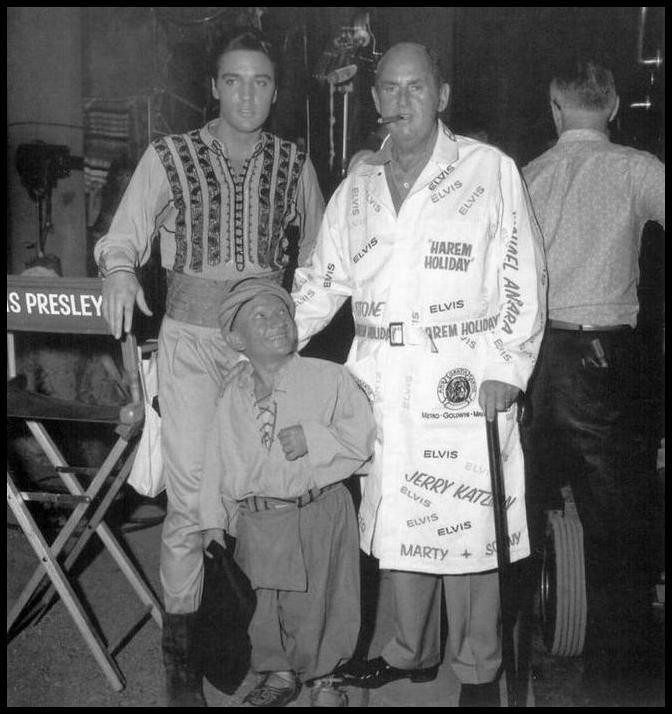 But Parker still wasn’t completely satisfied with the design of his movie-coat! 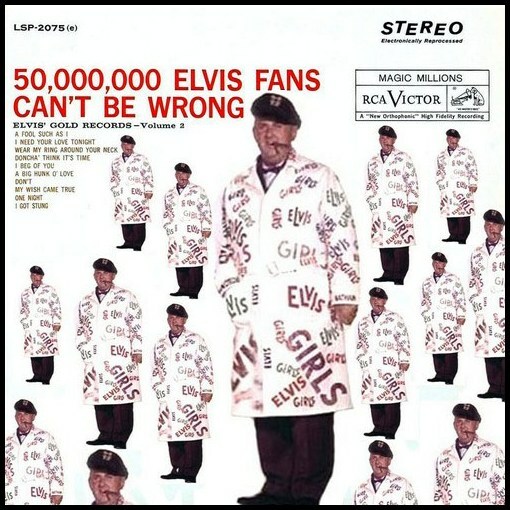 The only two words that were printed on this coat are ELVIS and GIRLS. The upcoming coats will also contain the name of the director and some of the co-stars, as well as the logo of the relevant moviestudio. 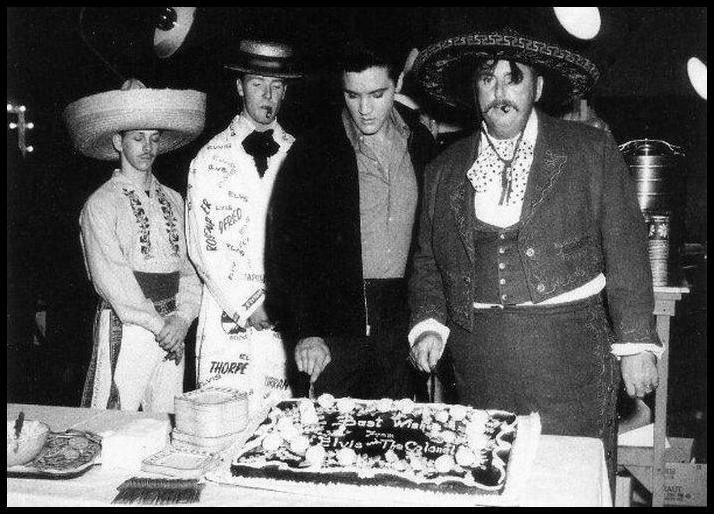 To celebrate the last day of shooting, Parker wore a mariachi outfit while he had someone else dressed up as … him! Priscilla joins the fun. 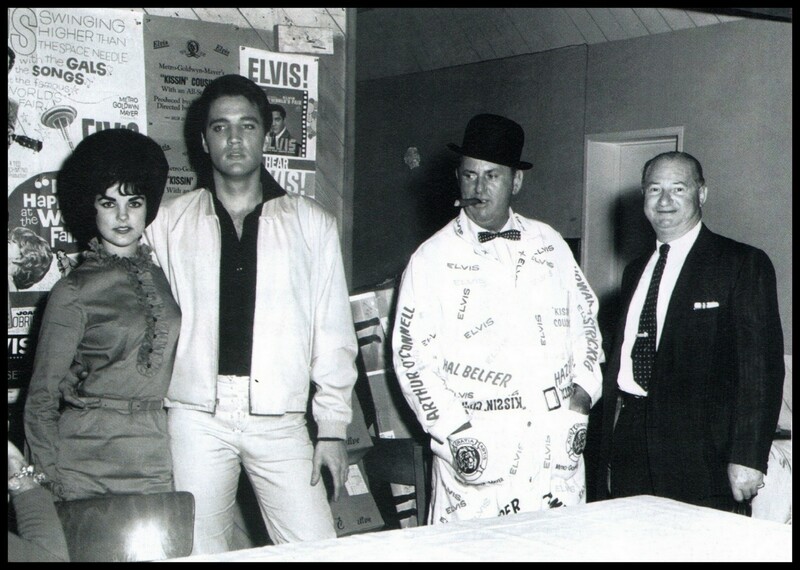 In the background of this November 1963 photo, we can see promotional stuff from Kissin’ Cousins and (mainly) It Happened At The World’s Fair. 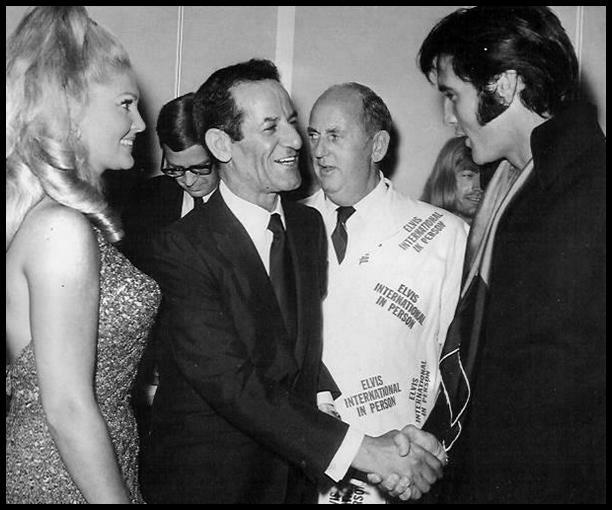 The gentleman to the right is Sam Katzman, he produced Kissin’ Cousins. 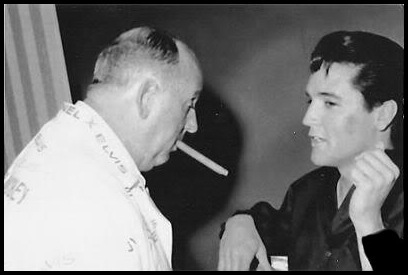 His not very flattering nickname was “King Of The Quickies”. And what is Parker looking at? 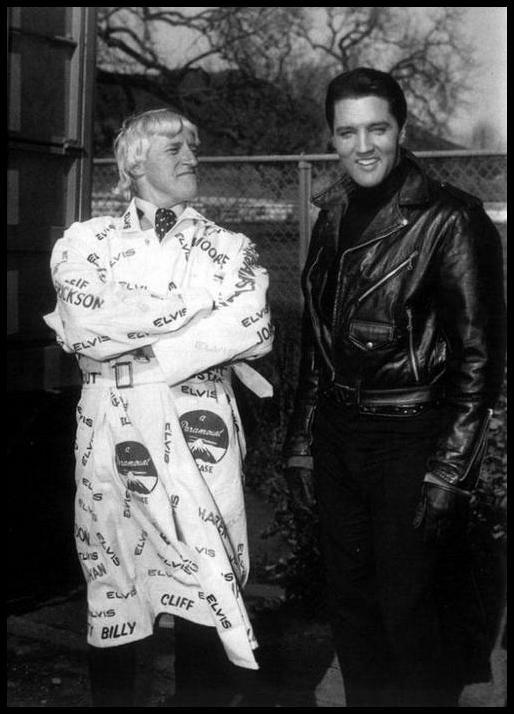 Below we have a series of photographs of a British celebrity (whose name will not be mentioned on this website) visiting the set of Roustabout and wearing Parker’s Movie-Coat. To my knowledge, none of Parker’s Movie-Coats have ever appeared in any auction. 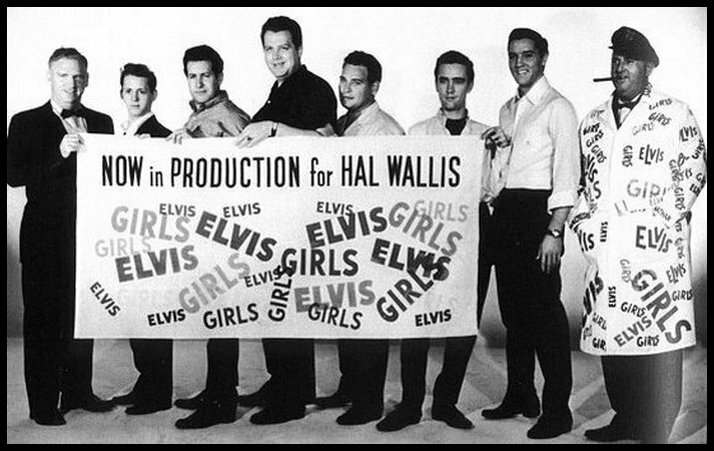 And I can’t remember having seen them on display at Graceland or in one of the museums. Were they destroyed or was their quality so bad they did not stand the test of time? Or are the Coats currently in the private hands of a raincoat-fetishist? 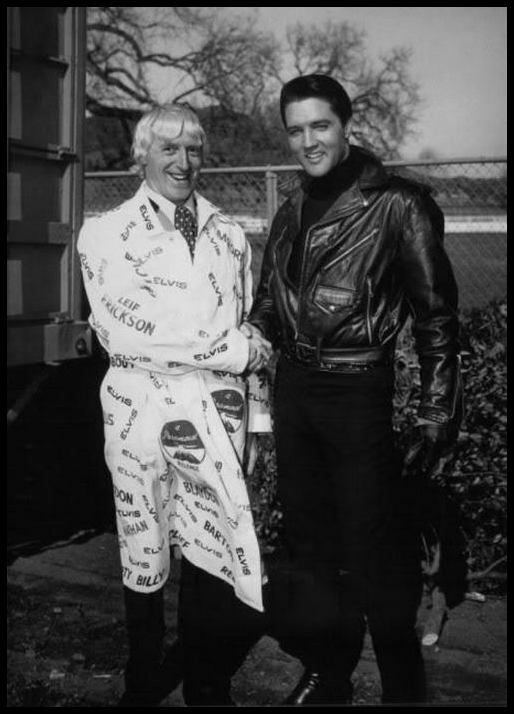 All kidding aside, it would be interesting to know what happened to the Coats once they became obsolete. This photo is quite telling. 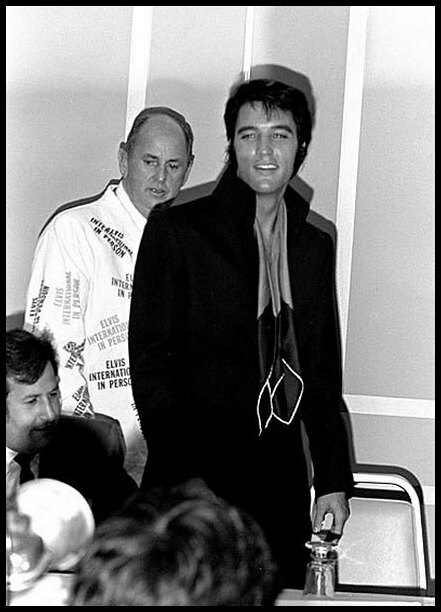 To think that Elvis once so regretted that he had Steve Allen dress him up in a tuxedo for a few minutes on national television in 1956, while by 1965 he hardly seemed to care anymore about his image. 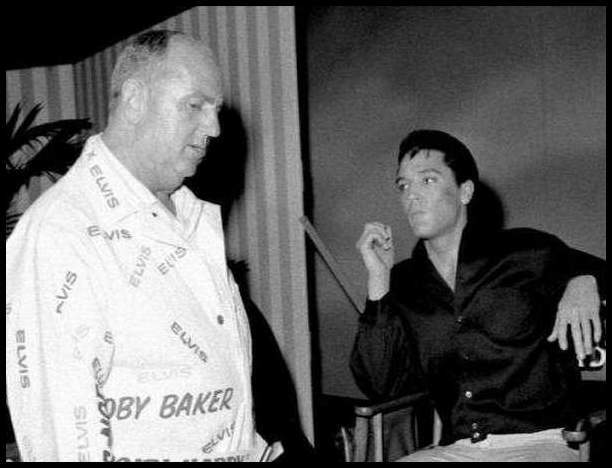 By looking at this photo, one can tell that Parker is now the main star of the show, the show in which Elvis Presley has completely turned into a product. 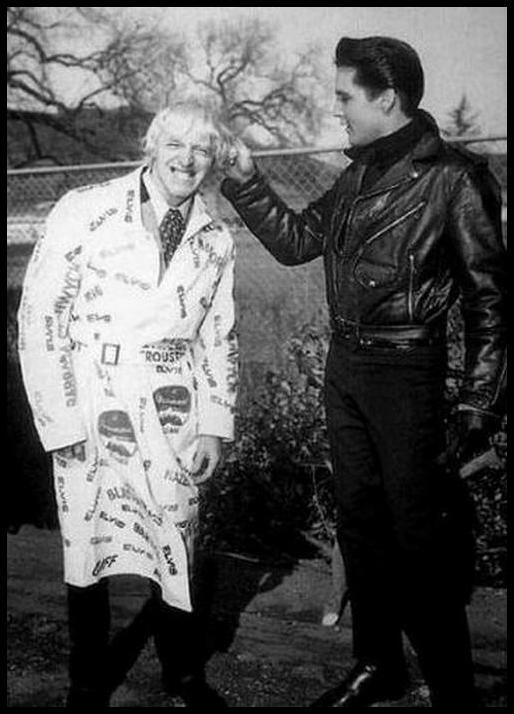 Check out the names at the bottom of the coat: MARTY and SONNY. Who said Parker had no sense of humor? 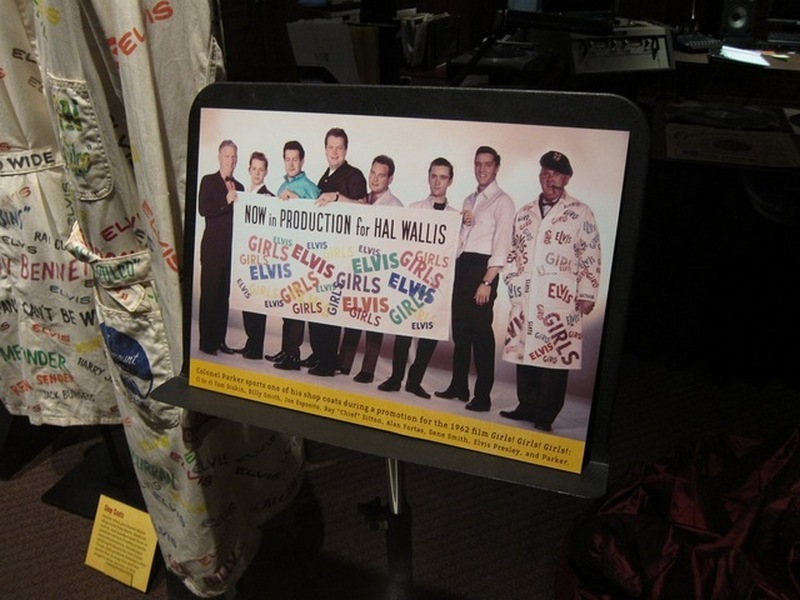 In the Roustabout photos, we can see the names of BILLY and CLIFF around the same position. 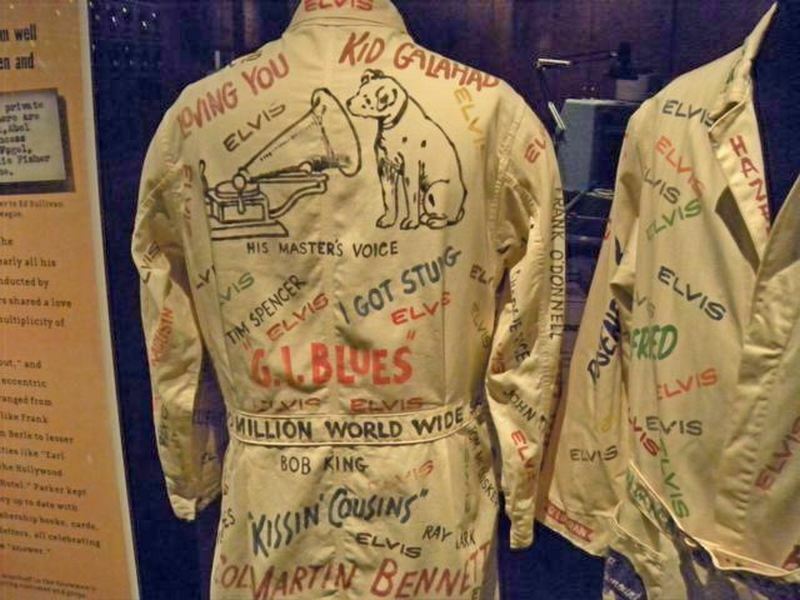 After this article went online in 2014, a helpful Elvis-fan let me know that at least two Parker Coats had stood the test of time since they had been on display at the Country Music Hall Of Fame during a special exhibit in honor of Parker’s 100th Anniversary in 2010 which ran for six months. 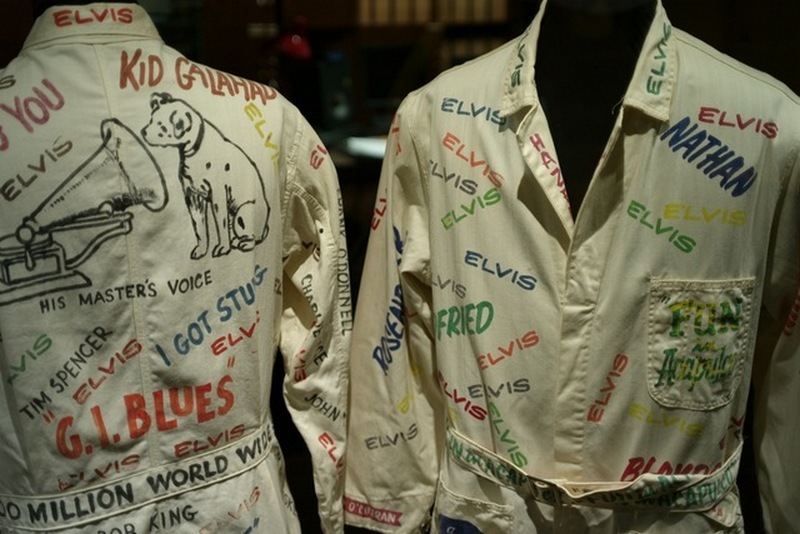 To the right we see the front and back of the already mentioned Fun In Acapulco Coat, plus also, what could be called an ‘All Purpose Coat’ since it seems to celebrate the sales of Elvis’ records around the world. 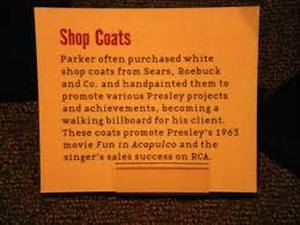 In the bottom left of this photo, we see an information card on which the Coats are simply referred to as SHOP COATS because Parker used to buy them at Sears & Roebuck and then had them handpainted in order to promote his latest Elvis project. Below a low quality image of the information card (apalogies for that), but at least the text is readable. 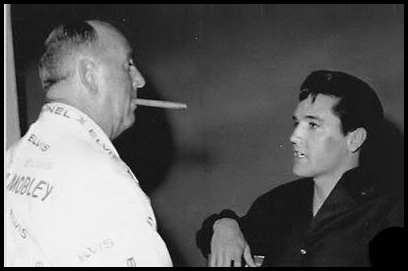 I always loved that story where The Colonel was attending an MGM Party but while being there he handed out Photos of Blue Hawaii, a Hal Wallis Production for Paramount Pictures. In the first photo, is that a banner for the Fame & Fortune single? It is partially hidden. Anyone have a full image of this? I dont believe I have ever seen one. 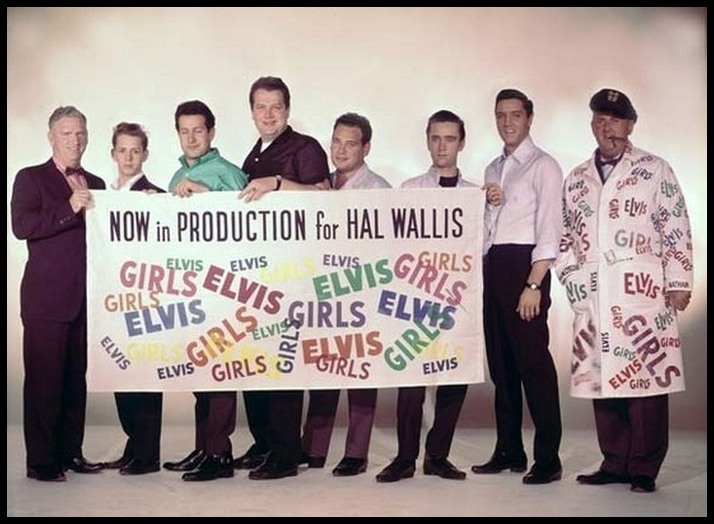 You can find / see a full picture of the banner in the booklet of Elvis Is Back! FTD release. That is correct. 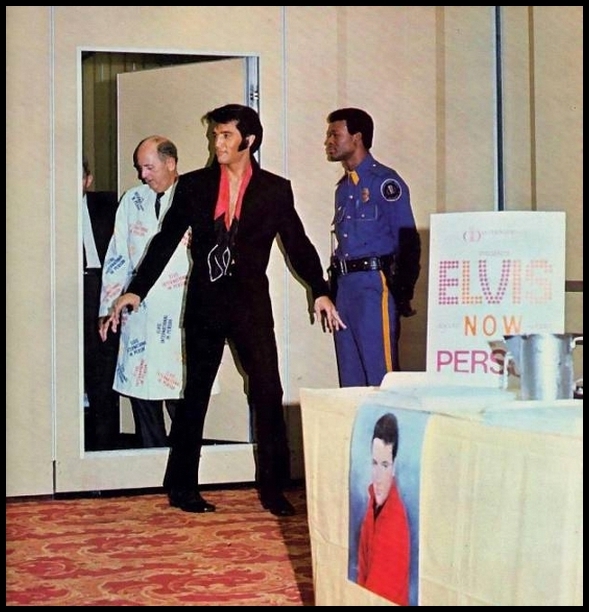 Plus there is also a photo of a recordstore in the booklet of the Elvis Is Back! Legacy Edition that shows the Stuck On You banner. Great topic! Great job Bob. I’m flabbergasted ! Brill ! Will the coats ever pop up?? Very enjoyable, as always: thank you. Great, great thread Bob, thanks! Thanks Bob, for a brilliant article. Never seen these before, lovely work Bob, a pleasure to see. 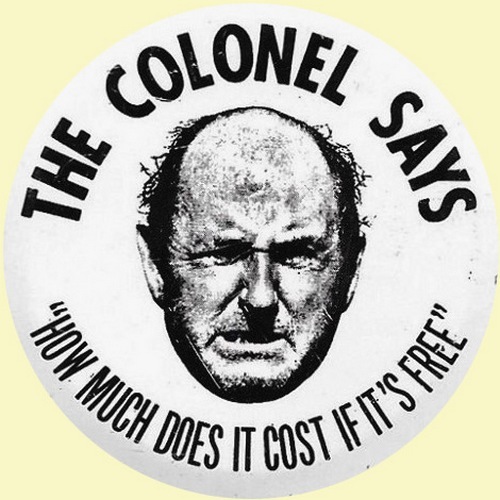 Great article on what’s probably an overlooked topic … you couldn’t take the carny outta the Colonel … fascinating insight! I have the Harum Scarum coat.